I can’t talk about what he’s been doing to me. He groped for the buttons on my jeans, trying to undo them. “Let me go,” I gasped. When her neighbor touches her where she doesn’t want to be touched, twelve year-old Cassie is confused and frightened. What should she do? Where can she turn? Directly from New Wind, from Amazon, or your local independent bookstore. Booksellers: Our titles are available through Ingram Distribution. 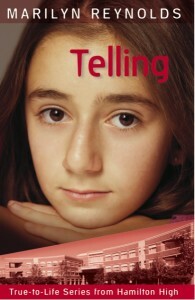 Telling has also been translated into Chinese (not available through New Wind Publishing).